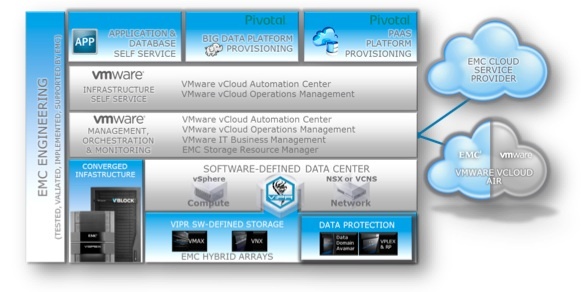 When it comes to its newly “redefined” hybrid cloud strategy, EMC has all the boxes checked. Planned support for Amazon Web Services, Microsoft Azure, OpenStack and (of course) VMware vCloud Air public clouds? Check, check, check and check. In addition to its already-reported acquisition of Cloudscaling, an OpenStack cloud purveyor, EMC is also buying Maginatics, a software-only cloud storage offering, and Spanning Cloud Apps a data backup and recovery vendor — all to help expand that hybrid cloud. Cloudscaling offers an OpenStack cloud that supports key AWS APIs. Cloudscaling founder and CEO Randy Bias is joining EMC Emerging Technologies’ group led by President CJ Desai, while Maginatics CEO Amarjit Gil and Spanning CEO Jeff Erramouspe will join a new EMC Core Technologies Division headed by Guy Churchward. The Cloudscaling, Maginatics and Spanning teams are all joining EMC as well. EMC says the overall goal is to provide a hybrid cloud that can be “implemented in 28 days or less” using EMC Professional Services. That model is a far cry from the how early cloud adopters worked. Those trailblazers were typically developers working outside IT purview to spin up instances on AWS to build and test new applications. EMC’s hybrid cloud blueprint reflects growing corporate, and IT-sanctioned, adoption of cloud for production workloads. More businesses see the advantages in terms of cost and/or agility of cloud use, but also feel the need to keep key workloads running in-house on a “private cloud” for regulatory, security or performance reasons. That’s the card legacy IT companies — including EMC, [company]VMware[/company], [company]HP[/company], [company]IBM[/company] and [company]Microsoft[/company], as well as companies like Nutanix — are playing to push their hybrid cloud agenda which keeps those workloads in-house but allows other workloads to run in a public shared infrastructure cloud. They’re all offering clouds that — they hope — customers will deploy using their server/storage/networking hardware. But that flies in the face of the [company]Amazon[/company] public cloud juggernaut, which relies on massive numbers of low-cost servers running shared workloads. It’s clear that these vendors are all searching for a captive market for their own non-commodity hardware. Hence their name-brand clouds. These vendors thus have to offer on-premises hardware solution and also a public cloud hardware solution. EMC has always done so, as have its competitors like HDS, NetApp, etc. The trick in a hybrid environment is to get the public and private cloud applications and workloads to integrate seamlessly.